Above: Binnein Beag and the Grey Corries. Kinlochleven seems a bit out of the way with it being by-passed by the Ballachulish Bridge. 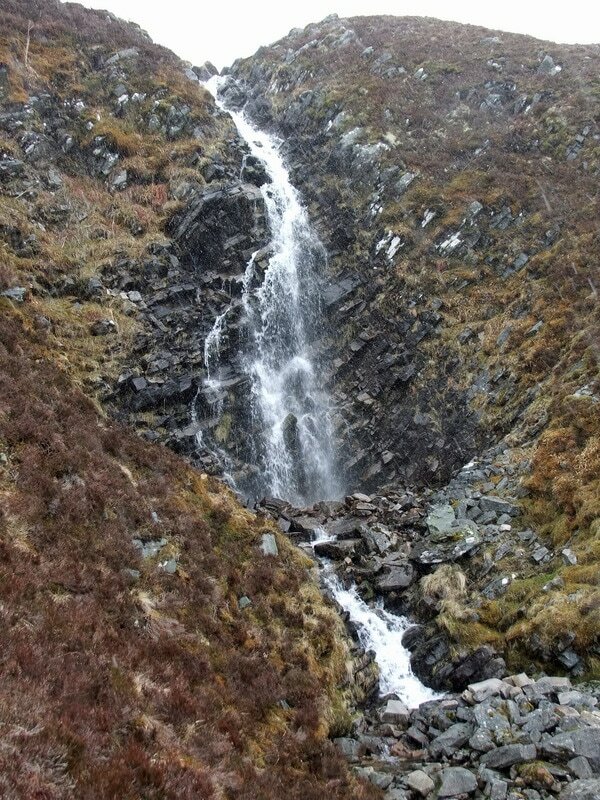 This was only my third time of heading out into the hills from Kinlochleven. The first time was for the Rock & Run Mountain Marathon in 1990. I did not own fell shoes at that time and was one of the few competitors in boots (Scarpa Mantas). 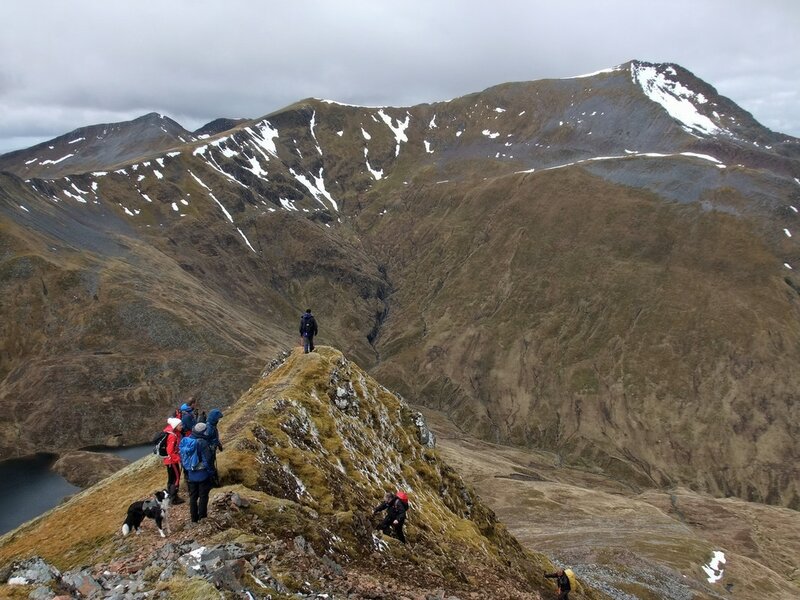 The Munros bagged as part of this event were Am Bodach & Sgurr Eilde Mor. The second time was with my future best man, Simon as he rounded up his remaining Munros in 1997. Our route included Na Gruagaichean and Binnein Mor. This was my third walkhighlands meet, staying at the excellent Blackwater hostel. 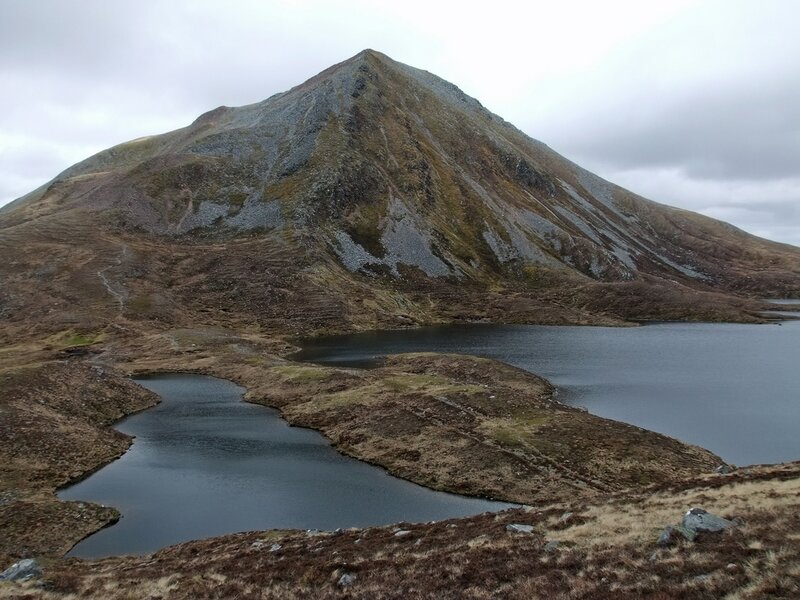 We set off as a group of six but on reaching the track to Loch Eilde Mor, I stuck to the route previously marked on my map, following the track for a little way, losing altitude in the process, before heading up a path up towards the Allt Riabhach. Someone in the party suggested that it was a "Top Gear Challenge" to see who got to the top first. The path was faint but clearly marked by a small cairn in the middle of the track. The path was a bit soft and squelchy in places but leads up to a waterfall with the water continuing down large slabs of rock. I was keen to explore the mountain more than having an outward and return journey along the same paths. 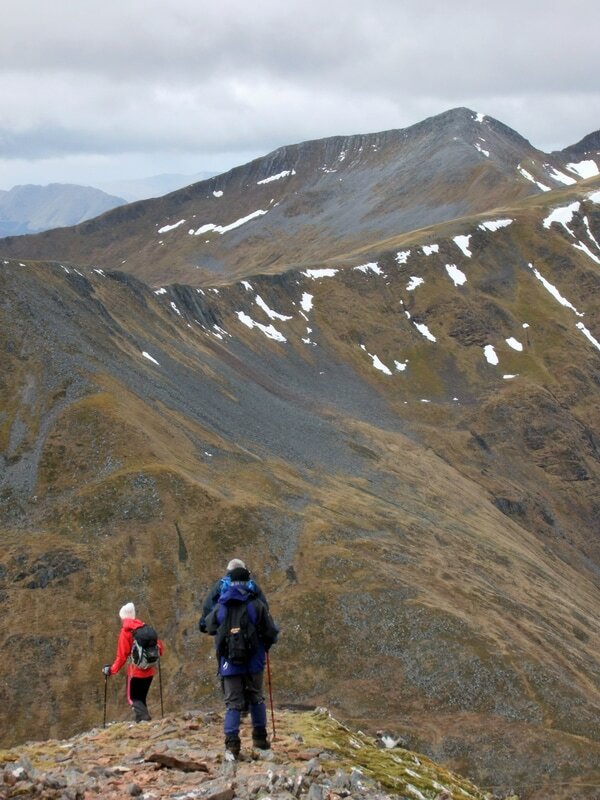 The continuation from the lochan, up the south ridge was extremely pleasant with some rocky sections higher up. Who won the Top Gear challenge? Well two of the group of five reached the cairn just seconds ahead of me, but the whole of the group needs to reach the cairn, right? 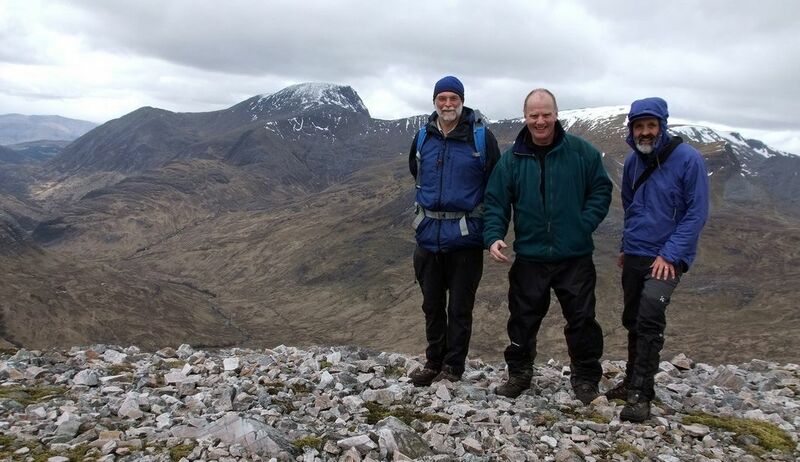 Seven Walkhighlanders at the summit of Sgurr Eilde Mor. The bearded gentleman to the left was there ahead of us all but had left Kinlochleven ahead of everyone else. Earlier, the Aonach Eagach had been hidden by the Corbet Garbh Bheinn but was clearly in view at the summit. Descending the west ridge. The main peak seen here is Na Gruagaichean. Na Gruagaichean and Binnein Mor. The descent was down angular scree that generally was not deep enough for scree running and required a little care. I was told that the ascent was two steps up and one back down due to the instability of the scree. This left me even happier about my chosen route of ascent. Our next objective could be seen ahead along with the clear path connecting the two Munros. At the low point in the path where it crosses a burn, we stopped for lunch. Some of the party (the young ones) wanted to continue to Binnein Mor and An Gruagaichean, so I suggested that this was good point to form two groups with the youths plus Mountain Mutt pushing on ahead. 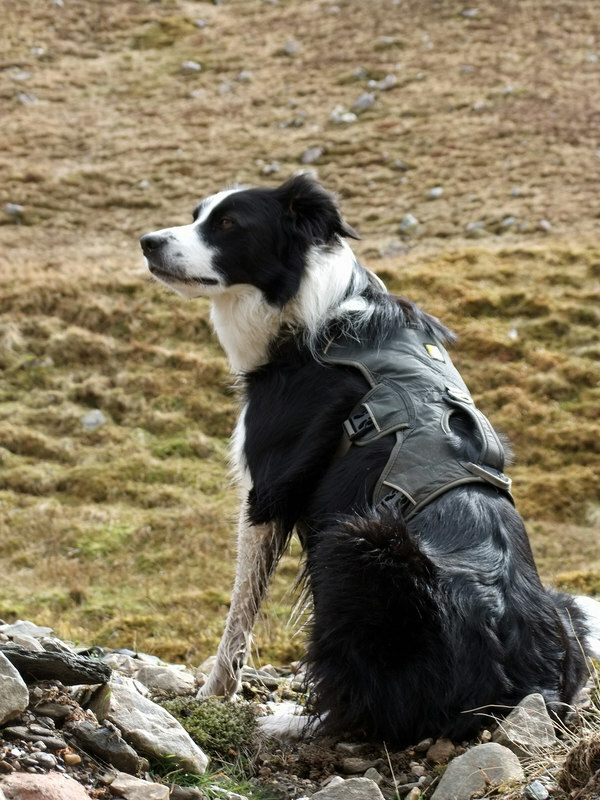 Mountain Mutt - always showing that four legs are better than two. Reaching the lochan at the base of Binnein Beag: Ben Nevis, Carn More Dearg and Aonach Beag. View from the summit of Binnein Beag: The Mamores left, Glen Nevis and Ben Nevis/CMD/Aonach Beag/Aonach Mor. 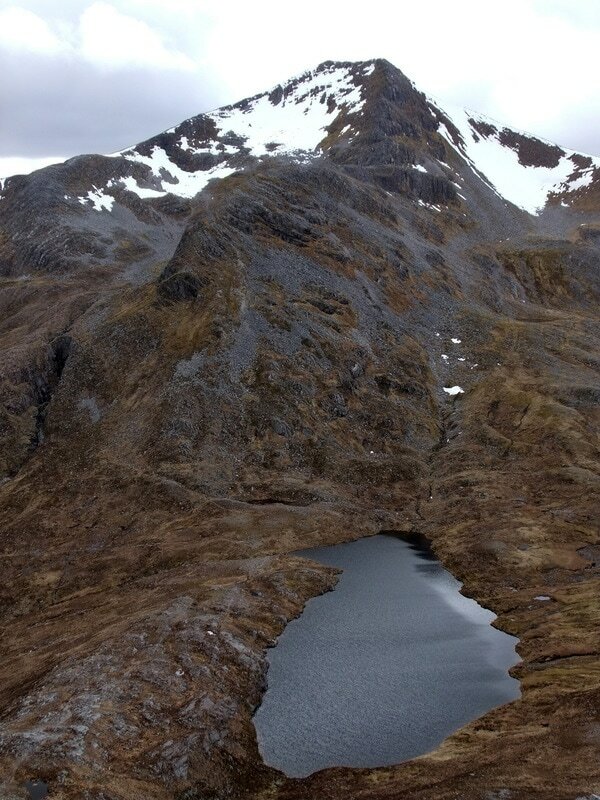 Sgurr Eilde More (L) and Binnein Mor (R). Creise and Buachaille Etive Mor can be seen through the gap. The slow group on Binnein Beag. In March 1991 during a Glen Nevis based circuit of An Gearanach, Stob Coire a' Chairn, Na Gruagaichean, Binnein Mor and Binnein Beag, I had descended via the steep NE ridge of Binnein Mor in winter conditions. I do not remember any particular difficulties, so it is easier than it appears from this angle. 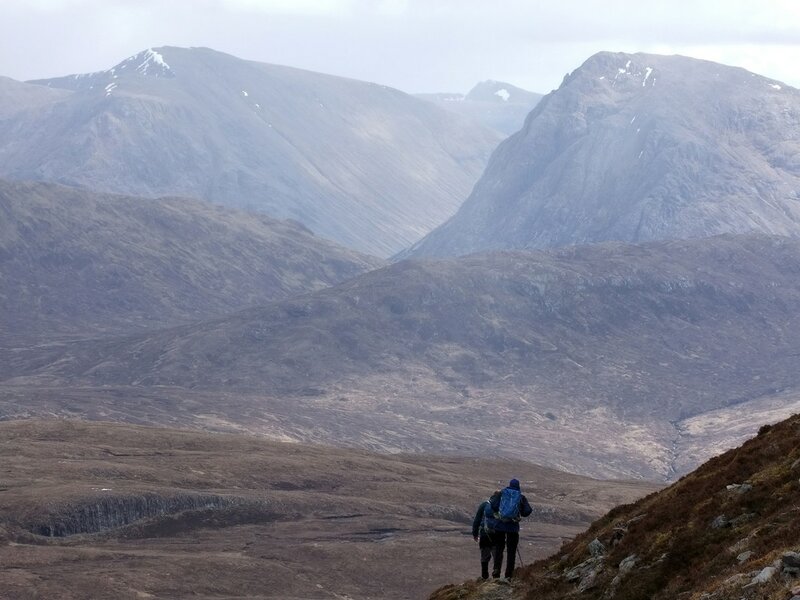 On this occasion, the stronger, more intrepid walkhighlanders cut across to join the north-west ridge that forms the right skyline. We three senior walkers headed back to Coire an Lochan, our old, tired legs reluctant to take on much more ascent. We were definitely taking our time and I stopped to take photographs. 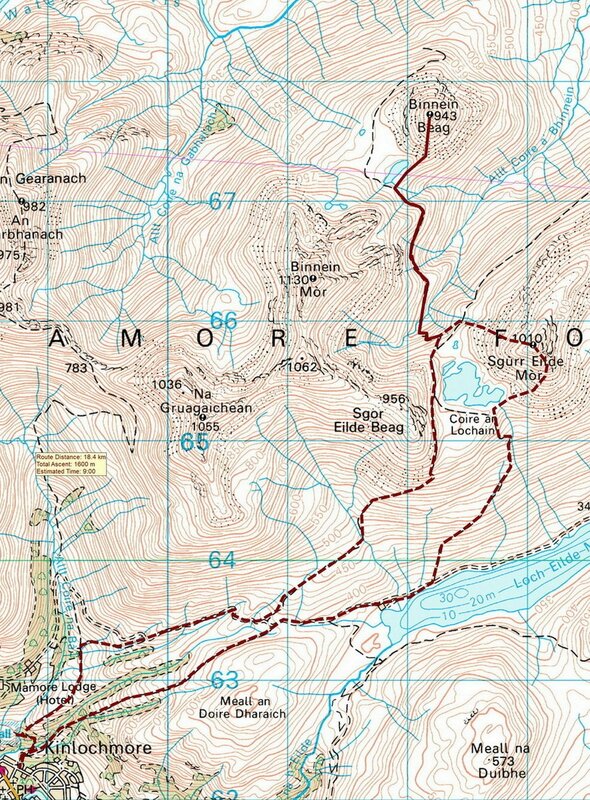 Here, Sgurr Eilde Mor. 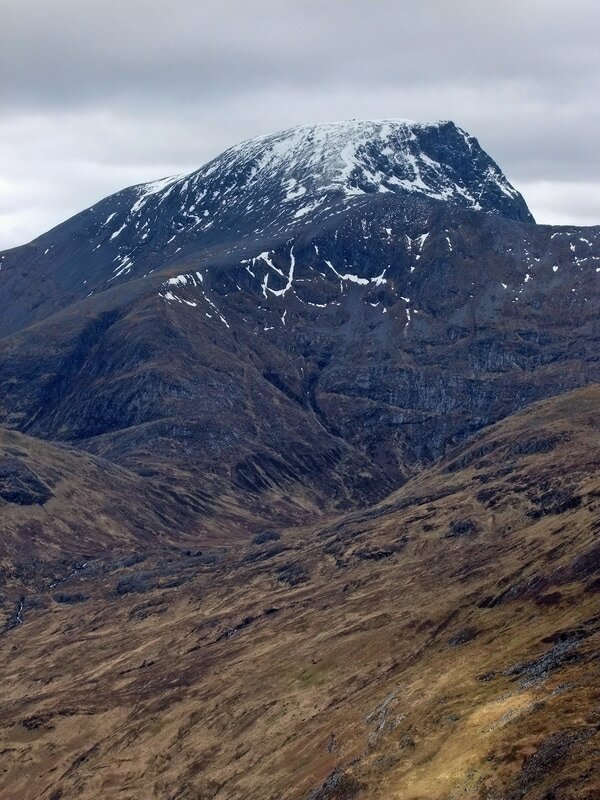 Creise and Buachaille Etive Mor with Crowberry Tower clearly visible. We took a different route back, following the track towards Mamore Lodge before taking the path down to the Grey Mare's Tail. 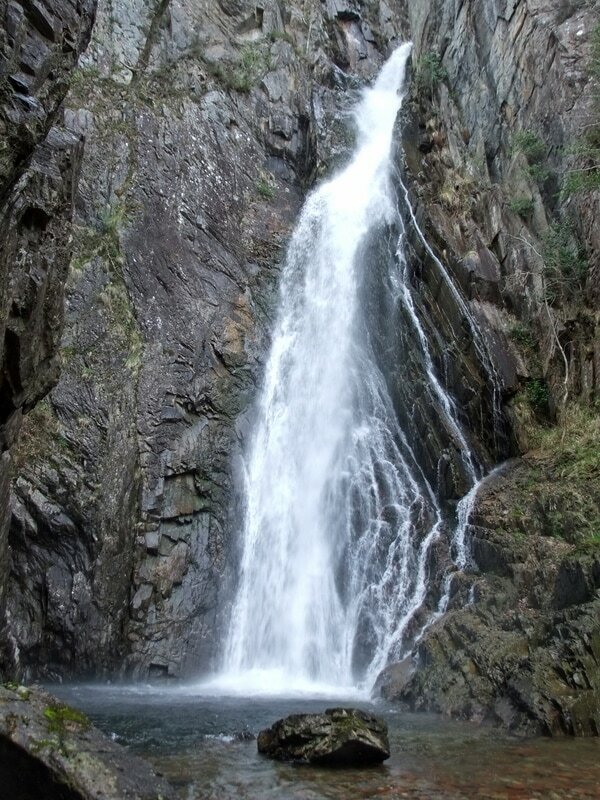 There are planks, a twin-wired crossing across the burn, cables and large staples leading to the base of the waterfall allowing a better angle to view and photograph the waterfall. These have been put in place by vertical Descents.